Since when did they take away the option of using a custom video size/resolution when running in windowed mode? I can now only choose full screen or tiny 320x240 postage stamp size? Weak Sauce. I can confirm Window re-sizing works perfectly on both Windows 7 32-bit Professional and 64-bit Home Premium with and without hlsl turned on. I just grab the corner of the window and make it as big, or as small, as desired while it also maintains proper aspect ratio. Did you try a clean install/folder? In the above, it will send the image to the second display using the aspect ratio dictated by the driver/system (4:3) and a custom resolution of 960x720. Works perfect on both of the aforementioned OS's, and as a side note, one graphics card is a 'Intel on a chip' (Win 7 Pro 32bit) the other is a Radeon 5670 HD (Win 7 Home Prem. 64bit). i was asked,if there is anybody,who owns a MAC and who could explain,how to get run the 7800? Can you use A78 files? And whatelse do you need to get the 7800 work on MESS? Cause i do not own a Mac,i could not help. or do other 7800 Emulators exist for the MAC? Step 1: buy a PC. Ah, well duh...I was looking in the options for the device, and in versions way back you could choose present standard resolutions, or a custom setting where you set one you want. Didn't think of just stretching the window. I think that didn't work in some older versions. Just tried MESS, it has now become my 7800 emulator of choice! I am working on a project right now that requires the use of the Hi-pass filter function of POKEY. In layman's terms: You store $04 in the AUDCTL register, then use channel 0 (AUDC0 and AUDF0), zero AUDC2, and use AUDF2 to modulate the frequency in AUDF0. This can make some nice Commodore 64 SID type sounds. Wow MESS has always been a mess with 7800 as far as I am concerned. Bob has a version of the ProSystem Emu that he uses that has not been released to the public. I wonder how it stacks up to the new MESS. Don't know but I'd be willing to get my hands on it and try it. 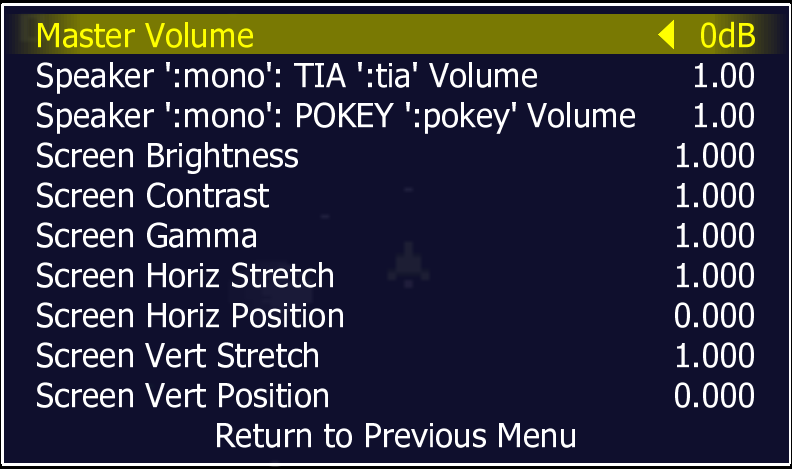 It'd be okay for me as long as it correctly emulates the POKEY behaviours described above. Bob has a version of the ProSystem Emu that he uses that has not been released to the public. I wonder how it stacks up to the new MESS. There is OpenEmu. Download the experimental version of 1.0.2 from here. Just a few notes/observations from my testing.. Horizon in Choplifter is fixed. Food Fight has a little graphic glitch at the top left. Not sure if it does this on a real 7800. A glitch in the Ace Of Aces title screen was fixed at some point. A glitch in the score line in Basketbrawl is now fixed. So I guess that just leaves lightgun support next? I do know how to use Prosystem on a Mac but that involves getting a WINE wrapper first. Food Fight does indeed do that top-of-the-screen glitch in real life. No lightgun plans for now. Edited by RevEng, Sat Apr 19, 2014 11:10 AM. What do you guys think of jsmess? It maybe is a better idiot proof emulator? I cant use it on my phone tho.. I need to turn on a "computer" someday..
Another great feature with MESS, you can stretch or/and align the screen vertically (And horizontally) to give the appearance of how great or small you prefer overscan and overall screen positioning. I see the glitch under my C1702, but there were many CRTs evidently that cropped out the top enough so it wasn't noticeable 'back in the day'. I use Mess on the Mac. It's really wierd how it works but it works. Put 7800 bios in proper folder. put your .A78 files in proper folder. Run mess. Click on 7800 PAL or NTSC when list of machines come up. Click on box to put a check mark next to "Insert/Eject disk or cartridge" on left. After games window pops up, click on .A78 file you want. Then click on Done button. After 7800 Window pops up, hit Return on your keyboard and you should then see the Fuji. More steps than my devcart, I love it. Yes because your development cart is not here on my desk which means there are no steps. But hopefully not for long. Speaking of steps...here's another go to simplify and get any still apprehensive or confused about configuring MESS for the Atari 7800 up and running, practically eliminating the entire setup process. 4. Press 'Tab' --> Arrow down to 'File Manager' and press 'Enter' --> After 'Cartslot' appears, press 'Enter' again --> Highlight game ROM (Use arrow keys down/up), press 'Enter' and play game. 'Esc' exits emulator. -NTSC and PAL BIOS files already stored to their correct location and structure. -The entire NTSC and PAL original library of games in their correct location and structure. -Press Alt-Enter to toggle between Window and Full Screen mode. -In Window mode, grab corner of window to modify size. B. Default controls: Arrow Keys, Left Ctrl, Left Alt (Remap via "Tab" menu). -First installed game controller under Windows automatically becomes mapped to Player 1 (Remap via "Tab" menu). EDIT 4/21 - Streamlined process further and made more versatile.